AKA.AKAC (Motor Driven Grease Pumps) | Products | Daikin Lubrication Products & Engineering Co., Ltd. 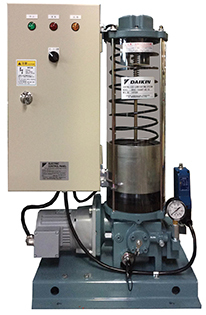 This motor driven grease pump is used in single line centralized lubricating systems. This automatic lubricating system has been designed to be simple and streamlined, and uses a single-piston pump mechanism which is driven by a geared motor. The pump and control panel are integrated, which enables easy automatic lubrication. Also, even more substantial automatic lubrication is possible if this pump is operated with a separately installed standard electric control panel. • The set pressures of the safety valve are 23 MPa for grease and 13 MPa for oil, respectively. • As this is an indoor type pump, protection such as installing the pump inside a cubicle is required, for example, when it is to be used outdoors or in poor environmental conditions. • Foundation bolts are not included. • The EK-3(T) control panel is attached only on the AKAC-108 type. • Only a low level switch can be connected and controlled on the 3(T) type control panel. • Note that the high level switch cannot be connected. When performing high level switch control, consult with us. • Items marked by an asterisk * are applicable to only the AKA-104 and 108 types.